The Rheims-Douay Bible had an extensive set of notes to assure that Scripture was interpreted according to Roman Catholic doctrine. 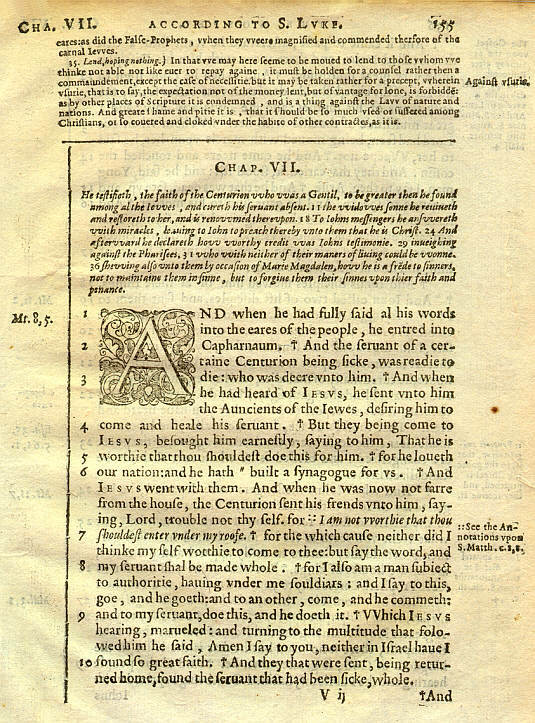 The small type at the top of this page show the notes for the preceeding chapter. Notes were also included in the margins. The inside margin had Scripture references; the outside margin was for explanitory notes and references to the notes of other verses. The publisher of the edition, Daniel Veruliet, did not choose to use CAPITAL "W's", or italic ones. Instead he used a pair of "V's". See the italicized part of Verse 6: "I am not vvorthie" (worthy). Notice also Verse 9: "VVhich Jesus hearing, marvelled." My favorite is in the chapter notes (in italic) for verse 11: " the vvidovves sonne" (widow's son). In reading some of the Bibles of this period, you find the letters "U" and "V" are used interchangeably. Notice Verse 5: " For he loueth our nation: and he hath built a synagogue for vs." In the word "loveth" the printer used a "U", but in "us" he used a "V". Go figure. Use the Menu on the left to view a closeup of another page from a Rheims-Douay Bible.